This ultracompact, 4-channel Nady Mini MM4 Mixer features low noise and transparent audio. It has 8 .. 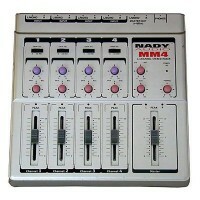 The Nady SRM-10X Mixer is designed for numerous studio and stage applications, from keyboard and mon.. The Nady GEQ131 is a single-channel 31-band, 5/16-octave equalizer in a single rack space. It featur.. The Nady's SRM-8 is an eight-channel mic / line mixer that features rugged construction, rackmou..
Offering up to twenty channels (including aux returns) plus 2 RCA tape inputs, this compact console ..